Although, by the end of 1968, negotiations had begun and the bombing suspension had been extended to all of North Vietnam , the U.S. still had over half a million soldiers in South Vietnam (for the 1968 activities, see chapter five of the book). Nixon, who succeeded Johnson as president, was determined to eliminate U.S. ground combat operations but without losing South Vietnam as a client. This evolved fairly rapidly into a two-part policy. The first part, and in our view, the most important, was to stop insisting that the U.S. would only withdraw its ground troops as and when North Vietnam did; instead, at the urging of his senior cabinet secretaries (the Secretary of Defense, Melvin Laird, had been a congressional representative and was acutely aware of the declining support there for continued ground combat operations), Nixon moved toward a policy of unilateral U.S. troop withdrawals. This took considerable effort to push through, as there was resistance from the military and the National Security Adviser, Henry Kissinger; but by the summer of 1969, Nixon was able to announce, along with Thieu, the first U.S. withdrawals. Before the end of the year, continued antiwar demonstrations had led to the policy becoming institutionalized, and U.S. forces began to be withdrawn almost as fast as they had gone in. In the meantime, both to mollify the military and to take over from the withdrawing American troops, the U.S. built up the size and firepower of the South Vietnamese armed forces (hence the term “Vietnamization”) and continued active air operations in support of both those forces and its own troops. The second, and far more controversial, part of the policy was to put pressure on the North Vietnamese so that, after a U.S. withdrawal, they would let the regime in South Vietnam survive. In pursuit of this goal, Nixon, with Kissinger's enthusiastic support, improvised various military and diplomatic actions. As we saw above, the U.S. began a secret bombing campaign over Cambodia in early 1969; this was followed by an invasion of Cambodia , another secret bombing campaign over Laos , and then an invasion (this by the South Vietnamese) of that country as well. 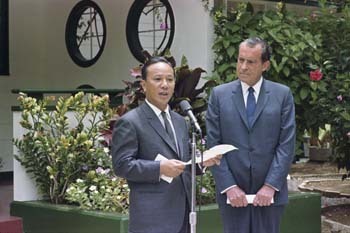 In addition, Nixon resumed bombing of North Vietnam, at first in early 1970 as so-called “protective reaction” for attacks on reconnaissance flights, then more extensively in reaction to ground fighting in South Vietnam, and finally on a massive scale (“Linebacker”: see this website) during and for months after the North Vietnamese offensive in 1972. These various military actions, most of them taken from Pentagon contingency plans, were intended to convey the idea that Nixon would, in a paroxysm of fury, engage in actions so dangerously irrational as to run the risks of a general world war, thereby frightening the North Vietnamese into concluding a peace agreement favorable to the U.S. This “madman theory,” to use the term reported by Nixon's chief of staff, was also directed at China and the Soviet Union, with the hope being that a combination of detente and concern over Nixon's stability would lead both states to put pressure on North Vietnam to compromise with the U.S. Just how accurate this theory turned out to be is highly contestable; what is striking, though, is that throughout the various bombing campaigns, the U.S. troop withdrawal continued. 1) Nixon in news conference, 5 October 1972; Nixon in meeting with Foreign Intelligence Advisory board, 18 July 1970, FRUS 1969-1976 , vol. 6: docs. 344; also 30, 39-41; McCloskey in State Department briefing, “U.S. Says Hanoi ‘Invaded' South, Keeps All Reprisal Options Open,” New York Times , 4 April 1972; U.S. proposal to North Vietnam, 31 May 1971 (Kissinger 1979: 1488 n. 11); Kissinger in meeting with Brezhnev et al., 22 April 1972 (ProQuest 2005: doc. KT00472, p. 8); Hersh (1983: chs. 5, 23, 31, 36, 38-40); Leonard (1994); Bundy (1998: 292-302, 350-68); Kimball (1998); Berman (2002). It is interesting to note that the command and control procedures put in place for Rolling Thunder (see the book, chapter six) were maintained almost unchanged for all of the North Vietnam bombing operations ordered by Nixon (Kissinger 1979: 1112).